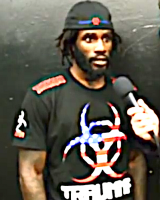 Bellator season six featherweight tournament winner Daniel Straus (20-4) was scheduled to fight the winner of Pat Curran vs. Patricio “Pitbull” Friere for the Bellator 145-pound title but Curran suffered an injury, so Straus is currently sidelined without an opponent and without a fight. ProMMAnow.com (www.prommanow.com) reporter Dan “The Wolfman” Theodore caught up with Straus at “Strikeforce: Rousey vs. Kaufman” in San Diego over the weekend where he was supporting his teammate Roger Bowling who was competing on the main card. Check out more ProMMAnow.com coverage and interviews from “Strikeforce: Rousey vs. Kaufman” and stay close as we have more interviews on the way.